Honey locust. It’s the classic urban tree. It flourishes in the challenging environment of cement and blacktop because it’s a particularly hardy species–highly resistant to road salt, air pollution, and heat. No matter where you live, you probably see honey locusts every day, in parks, shopping malls, and housing developments. But this particular variety of honey locust merits a closer look. 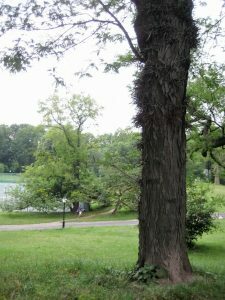 This tree, in Manhattan’s Central Park, has thorns. Big thorns. Not just little prickers, great huge whomping thorns, six inches long and iron hard. Old-time carpenters actually used them as nails. But here’s the interesting thing. This is the first and only honey locust I’ve ever seen that had thorns. Most honey locusts, the ones planted in malls and parking lots across America, have no thorns, not one. After a lot of genetic tinkering, horticulturists have developed a thornless variety of honey locust, especially designed for areas where humans might come into contact with it. Honey locust defanged, as it were. This seems practical and convenient. 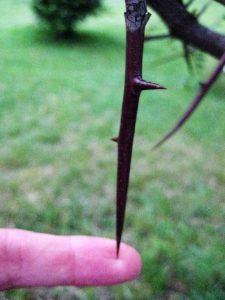 Don’t want sharp thorns in an area where kids might prick themselves. Non-thorny branches are safer. And these days, it seems, it’s all about safety. Where are we safe? How can we be sure nothing bad will happen—at a concert, in an airport, at a firework celebration? Danger seems to be lurking everywhere. 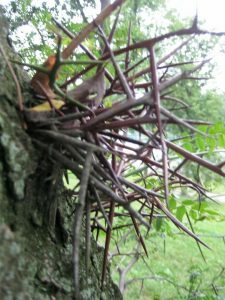 Honey locust, being a native species, pops up not infrequently in Native American stories—probably because the wicked thorns made it a useful bad guy. And many of these legends, like most folklore, have what anthropologists call a “test-theme”–the hero or heroine has to be tested somehow, achieve something, prove something. 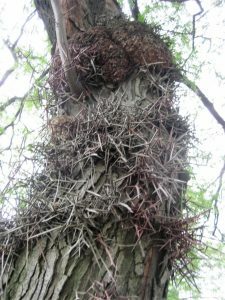 In a long-forgotten Cherokee myth about the Thunder Spirit, the dreadful spines of honey locust are the test. The sharp spines of the honey locust were needed in order to perform the crucial test–to weed out the special from the ordinary, to recognize a god. The thorns were, in a way, sacred. But Thunder Man would be out of luck with most honey locusts today, where all the branches are smooth as a baby’s bottom. So what do we lose, when we take the thorns off the honey locust? It seems to me it’s a little like putting up guard rails on a steep, high mountain ledge. Safer, but it’s not quite the same view.